Are you a builder of great things in InfoPath who's looking to learn how to deliver those great things on a more robust platform? Like most InfoPath power users, you've been using your unique skill set to build awesome forms for a while. You're very satisfied with your forms, but you also know their limitations: the "classic" feel, a less-than-ideal experience for mobile devices, the uncertainty of their future viability, and always being trapped in a box when it comes to connecting to other services without writing code. The PowerApps team has heard these and many other challenges. They've worked hard to incorporate a better experience and enable you to create canvas apps by leveraging your existing business and technology skills. By using PowerApps, you can quickly build and deploy the right business solutions without writing code. PowerApps is a Software as a Service (SaaS) platform that's designed to let you quickly build high-functioning apps that you can deploy to the web, SharePoint, Dynamics 365, Teams, Power BI, or a mobile device without any extra work. Because you can deploy them by just giving someone the URL to your published app, they're also just as easy to update. Have you ever tried to build an app and then publish it for iOS or Android devices? It's complicated. If you want to deploy a second app or update that existing one, your users must take a lot more steps. Not with PowerApps. Your users install PowerApps Mobile on their devices and sign in. Voila, they have all of the highly functional apps that you have shared with them. In the future, when you update those apps or push new apps out to them, those apps will show up on your users' devices. Mobile apps without the pain of managing devices is a big win for you and your business. With PowerApps, you can leverage the power of the user's mobile device. You have access to acceleration, the camera, the compass, the connection information, and location signals: all from within your app. This opens up a whole world of possibilities for building apps to get work done. Of course, touch functionality is just automatic in PowerApps: nothing extra to code when you build your app. With InfoPath, you normally work with data from one source. However, things got tricky if you wanted to update another source (such as a SharePoint list in another site collection) or connect to external services. Concepts such as code behind kept you awake at night. PowerApps is designed to allow you to work with multiple data sources and service connections in one app. Currently, more than 200 connectors support a combination of on-premises and cloud data, including Microsoft Office 365 and Azure services such as Microsoft Flow and Dynamics 365. You can also connect to a multitude of third-party services such as Dropbox, Google, Salesforce, Slack, and other popular targets. Now you can build solutions to scale where your users need to take you, not just where the original data lived. PowerApps is a great tool for making your SharePoint experience better in two ways. You have the option to either customize the forms for a SharePoint list or to create a standalone app for working with SharePoint data. Customizing a SharePoint form is great if you want to customize how users add, view, or edit items in a list that they use for their everyday work. Clicking Customize Forms will create a single-screen "forms app" that will change modes (new/edit/view) based on context. SharePoint manages these apps; their permissions are the same as the list permissions for editing/viewing. Creating a PowerApps canvas app from SharePoint allows you to run the app by itself on a mobile device. You can also embed the app in a SharePoint page. Clicking this will create a three-screen app (browse list, view details, and create/update an item). The permission/sharing model for these apps isn't tied to SharePoint but instead is managed from PowerApps. Now that you understand the difference between the two options, the following section will give you an overview of using each. The PowerApps and SharePoint teams have worked together to create a customization story for you to use with SharePoint. If you're like most InfoPath developers, you learned InfoPath to interact with SharePoint. SharePoint is great, but the default forms are a bit pedestrian and don't allow for customization or business logic without InfoPath. Well, that was the old way. With PowerApps you can now customize your list forms as native functionality. And when you do so, you get the full power of PowerApps. In the screenshot below, you can see an example of a PowerApps form with a Power BI report embedded. The entire solution was done in less than 15 minutes. Another important feature of PowerApps is the ability to easily connect to another SharePoint site collection or a different environment from the same form. For example, do you want to make one form that displays and updates data from your SharePoint Online and SharePoint on-premises environment at the same time? No problem. If you install the on-premises data gateway, you are up and running in a few minutes, connecting PowerApps, Power BI, Microsoft Flow, and Azure Logic Apps with your on-premises data. No changes to firewall rules are required. You can go a step further by connecting this app with Microsoft Flow. Use this technique if, instead of just updating the list-form experience, you want to build a full, standalone app based on your SharePoint data. This is also the best way to get started, so you can start to learn how the PowerApps canvas works and build future apps from any of the multitudes of data sources. Open the SharePoint list from which you would like to build an app. On the menu bar, select PowerApps, and then select Create an app. Provide a name, and then select Create. PowerApps will build you an app that you can customize. Start with a simple custom list that contains just a couple of fields of different types for your first app. This will let you build a solid foundation without being overwhelmed. Don't worry; you'll be a pro in no time and ready to tackle those complex apps. For help walking through this first app, check out this documentation or this community video. The examples below will show common InfoPath tasks and how to do them in PowerApps. Each of these builds on a simple SharePoint list app. How do you do that with PowerApps? Now that you know the fundamental concepts, let's go further. With your first app under your belt, this section will help you apply some of the common InfoPath concepts in PowerApps. Successful forms often enforce strong business logic by, for example, changing the state of a field based on a value or an action. 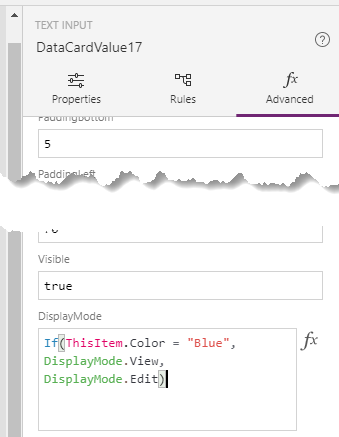 With PowerApps, you can set the DisplayMode property of a control to Edit or View to specify whether a user can change the field. You can also use a simple If formula to do so conditionally. First, select the card that you want to edit, and then select the lock icon. This step unlocks the card so that you can change the value. In the right-hand pane, scroll to the DefaultMode property so that you can edit it. This formula says that, if the current item's Color field is Blue, the Animal field is read-only. Otherwise, the field is editable. To hide the card instead of making it read-only, insert a similar function in the Visible property right above DisplayMode. In a similar manner as above where you hid the field, you can also provide visual feedback to users. Maybe you want to highlight text in red if the entered value falls out of the acceptable range or change an upload button's text and color after the user uploads a file. You can do both by using a function, such as If, in properties such as Color or Visible. IsMatch supports a plethora of predefined patterns, such as Email, or you can create your own. For more information about conditional formatting, check out this community video. With this, you can show a form or button only if the user has access to edit. Check out the DataSourceInfo documentation for the full list of information for which you can query in the function. You'll need to dig deeper if you want to use Active Directory groups to manage access to buttons or forms in your app. To do this, you'll take advantage of the flexibility of PowerApps and create your own connector using the Microsoft Graph API. If that sounds daunting, you can follow this blog post for step-by-step guidance. You can send an email message from PowerApps in many ways, but the easiest is to use the Office 365 Outlook Connector. With this connector, you can send a message as yourself from your app. You can also get email messages and other tasks that interact with your mailbox. There is documentation or this community video about sending email. You can send more complex message (for example, as part of a SharePoint approval workflow) by using Microsoft Flow and connecting your app to the flow that you create. Once you connect your app to Microsoft Flow, you've opened up the full power of a workflow engine that, like PowerApps, is very well connected to external data and services. For more information about how to connect PowerApps and Microsoft Flow, check out this documentation. If you still haven't found the email option you're looking for, you can also leverage the PowerApps connectors for Benchmark Email, Gmail, MailChimp, Outlook.com, SendGrid, or SMTP. Connectivity is the beauty of PowerApps. It's hard to talk about business apps and business logic without a workflow engine. The good news is the PowerApps team didn't reinvent the wheel and give you another workflow engine. Instead, they provide you with a robust connector to the Microsoft Flow service. You can automate processes and tasks across more than 200 different services through their easy-to-use workflow engine. For more information about how to connect PowerApps and Microsoft Flow, check out this documentation. When you build solutions, it's natural to think variables must be involved. PowerApps offers multiple types of variables, but use them only when necessary. Instead of thinking about getting data, storing it in a variable, and then referencing that variable, think about just referencing that data directly. You can better understand this model if you compare it to Excel. In Excel, Total isn't a variable; it's the sum of other fields. So, if you want to use that value elsewhere on the sheet, you specify the cell in which you calculated the total. The documentation has a great explanation of all of this. Be open to a different thought process. Then you can reference YourVariable by name throughout your app. This example sets the value of a variable, named Submitted, to true. You might add this formula to the OnSelect property of a submit button to track that the information has been submitted and change all of the fields to read-only. Collections store tables of information that can be updated individually. Use the Collect to create a shopping cart, for example, as the user tags various SharePoint items they want to send. A community video shows that concept in action. Cascading dropdowns are very useful because you can, for example, filter the choices in one dropdown based on the value selected in the previous dropdown. In PowerApps, these are often created by having two data sources in your app. The first data source is the data you're viewing or updating, and the second data source stores the values to build the cascading effect. This graphic shows an example of the second data source with the choice options. Just like that you have cascading dropdowns. 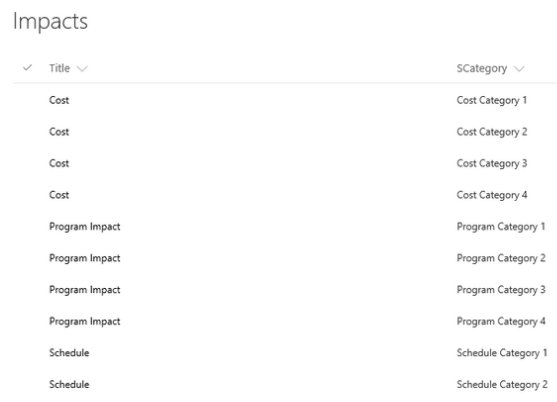 For more information, check out this post from the PowerApps team SharePoint: Cascading Dropdowns in 4 Easy Steps! or this community video. Don't worry: you can do it just as easily without SharePoint. With PowerApps, you can call one app from another. So, instead of the mass InfoPath form you built that's held together with bubble gum, you can build a group of apps that call each other, and even pass data across, making development simpler. With PowerApps and the information in this topic, you're now ready to go out into the world and start to conquer it one app at a time. As you continue on your journey, below are some handy links to help, such as the link to the PowerApps community site. Engage today with the community, and grow your skills much faster than you would on your own. Formula reference - Always a great way to become inspired, just browsing some of the default functions. PowerApps community - See examples, engage with others, ask and answer questions, and help the PowerApps community grow.